Relocation of all production departments into the newly built factory. The first VDU's connected to the Computer Installation. At this time Kullen & Mez were pioneers in this field. Official opening ceremony in March. Exhibition Participation: Participation at the Hannover Fair as well as the Hardware Fair in Cologne, DIY show in Stuttgart and Automechanika in Frankfurt. Machinery Assembly Department: Delivery of the hundredth bus cleaning plant. In June the subsidiary Company R.I.B. in Llandovery/GB was formed. Dennis L. Hickman became Managing Director. The previous Managing Directors Annelise Kullen, Dr. Helmut Kuhner and Ernst Friedrich as well as Director Werner Haaf retired. The administration area was reorganised. The machinery assembly works in Kleinengstingen was closed in order to concentrate fully on the production of technical brushes. Continual expansion and modernisation of the production plant, and reorganisation of the research and development department to intensify innovation in production. Expansion of wire wheel production at the R.I.B factory in Wales using the most modern machinery designed in house. The sales of technical brushes in Wales increase due to the creation of a dedicated sales organisation. Marketing efforts are strengthened e.g. by participating in 5 exhibitions of which 3 were abroad. A new catalogue covering the whole range of products is brought out. The product range has meanwhile expanded to include 55.000 brush types. Participation in 9 exhibitions of which 5 are overseas. Data processing is fully integrated using the most modern communication methods allowing visibility throughout the organisation, control and administration. The sales activities at home and abroad are supported by a series of advertisements in specialist journals and mail-shots. In January 1983 Dieter Kullen became the next Managing Director. In June 1983 Company Secretary Karl Stuhlinger retired after 50 years Service. Participation in 9 exhibitions of which 4 are overseas. In July 1984 Dennis L. Hickman resigned. Dieter Kullen becomes sole executive shareholder. Martin Holder becomes deputy Managing Director. 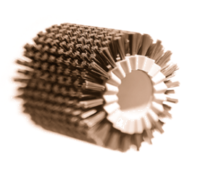 During the last few years Kullen & Mez has developed into the most significant manufacturer of technical brushes in Europe.